A group of people squatted a building, and started to paint, and hang out flags and banners. The banner says : “With hollow laws you cannot fill empty houses”. See https://squat.net/de/news/hamburg261010.htmlfor the original version. 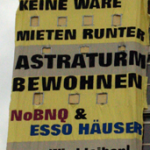 On saturday 23rd of october, about 6 000 people demonstrated in Hamburg against vacancies and for squatting, this was about double the amount of people that was expected. A broad alliance of 108 initiatives had called for the demonstration. In the last years there have repeatedly been squattings, that are mostly evicted by the police within a few hours (the last one on the 16th of october). One of the topics of the demonstration was that more than 1,2 million squaremeters of office space are vacant within the city, still new office blocks are beeing built and in the same time there is no affordable space for living and rents are increasing. The background of this absurdity of the kapitalist property market is the fact that vacant office space can be set off against tax liability. The squat on Gageldijk 71 in Maarssen (just outside of Utrecht, NL) has been brutally demolished while the residents were still inside the building. The residents only just managed to escape by jumping through a window from the first floor into the neighbour’s garden. At that moment the demolition workers, who knew there were people inside the building, were destroying the roof with heavy machinery sending wood, stones and glass flying around. Just before the first blow from the excavator, one of the residents hung out of the window to inform what was going on. (S)he could barely manage to jump away in time not to be hit by the machine. Today the Hotel Atlantis on the outskirts of the Swiss economic capital Zureich (too rich) has been squatted. The city is growing but affordable housing and autonomous spaces for experimenting souls are disappearing. Space is needed to live and unfold all the possibilities of human beings. The action went smooth and the cops didn’t even bothered to show up. As long as the owner doesn’t file a complaint they will not take action. The Company which owns the place is a multinational operating hotel exploitant: Rosebud heritage SA which owns also at least one hotel in Bruxelles. Hotel Atlantis has been empty for 8 years and will give home to various groups which are fighting the overpriced, through and through commercialized and ever increasing repression in one of the richest cities in the world. If you have any experience or information over the Rosebud heritage SA, please shared it with us, so we can make complete picture of their activities. We suspect them for quite some nasty things. On the 16th oktober a house in Hamburg was squatted just beside the Rote Flora. Like most squattings in hamburg in the last years it was violently evicted by the police just a few hours later. Seven squatters were taken into custody and released immediately after. The police used watercannons and pepperspray against the supporters on the street. “we squatted an empty building in the Schanzenviertel, the house was nearly empty for over 4 years, maybe the owner wants to wait until the Rote Flora is evicted in order to sell the flats for higher prices. In Hamburg rents are increasing, more and more rental buildings are turned into condominiums and there is more than 1 million squaremeters of vacant office space. Resistance against this situation is spreading, people who are renting places refuse to pay rent increases, there are repeatedly squattings and on 23 oktober there will be a demonstration against empty houses, empty office buildings and housing shortage. The demonstration will lead to the “Astra” tower, a huge office building in the middle of town that is 70 % empty. We’re gonna take the city! – New social centre opened in Oxford! 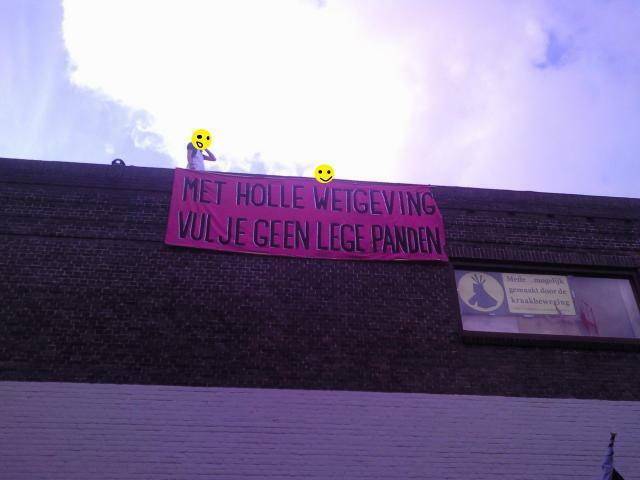 On the first of October, squatting in the Netherlands has been criminalised. The major cities, though decided not to execute this law. When the new mayor of Amsterdam Eberhard van der Laan announced a week ago to evict all of the existing 300 squats as soon as possible, people were very surprised and angry at the events. The next day the main prosecutor for squatting cases Otto van der Bijl and the chief of the special eviction unit Leen Schaap got threatened and are now under 24 hours police protection. In advance I want to clarify that I’m totally not a (political) pacifist. I believe in armed struggle and counter-violence against all parts of the repressive system we are living in. So coming from the Netherlands I was positive surprised by seeing such a lot of people acting offensive against the police brutality. Even If we couldn’t help the people in the house we made clear that repression against us will be answered. But for me acting militant is not only to use violence as one part of a diversity of tactics, it’s also about reflecting it. Because of this I want to speak about a few aspects of the actions on friday (oct. 1st). So I don’t want to be arrogant and this is only a subjective point of view. I don’t want to seem like teaching anyone an “one and only truth”. Other people will have a different point of view and so this is just a first input for further going discussions.